It has been awhile so an update is in order. Two of my diocesan brothers were ordained as transitional Deacons (which means they are preparing for ordination into priesthood in the near future) on the 28th of October – Brian O’Brien and Gary Kastl. 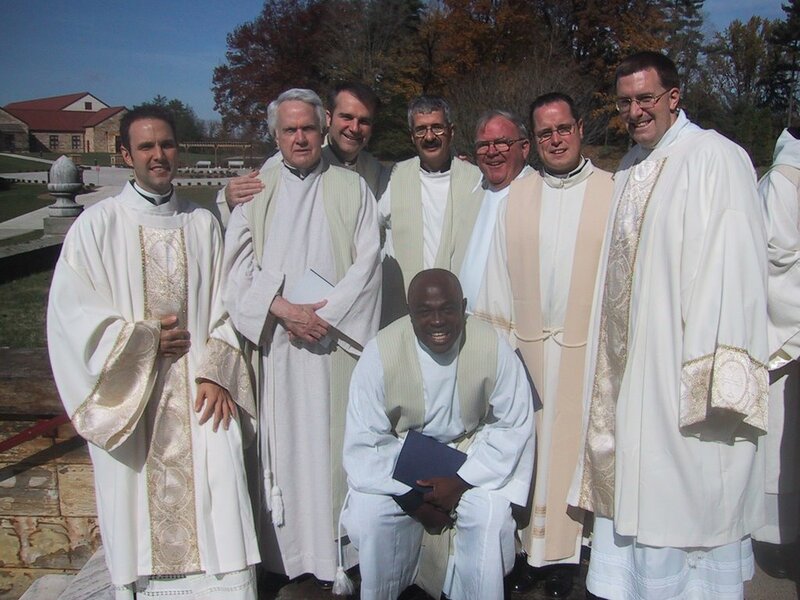 It was a wonderful ceremony and the whole weekend was a blessing to them and the other 11 men who were ordained. One of the events of the weekend was a social gathering at the Unstable on Saturday night. The new house band, Abbey Mode, played and it was the first and only stop of the “Official 2006 Reunion Tour of Anathema Sit”. It was good to play some music with Mark, Jeff, Steve and John. Here is a picture of our newest deacons and the priests from the Diocese of Tulsa that were in attendance. Standing from left to right are: Deacon Gary Kastl, Fr. Charles (Chuck) Swett, Fr. Jack Gleason, Fr. Michael Knipe, Msgr. Dennis Dorney, Fr. Matt Gerlach, Deacon Brian O’Brien. 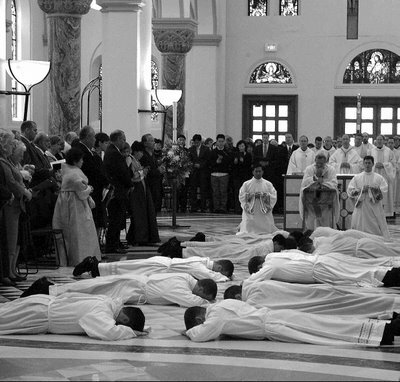 Kneeling in front is Fr. Valentine Ndebilie. Here is a picture of the 13 men lying prostrate as the Litany of the Saints was sung, and just before the Archbishop laid hands on them in the Sacrament of Holy Orders. I made a quick trip to Tulsa last weekend to play at Catholic Charities’ Walk for Adoption on Sunday, November 5th. 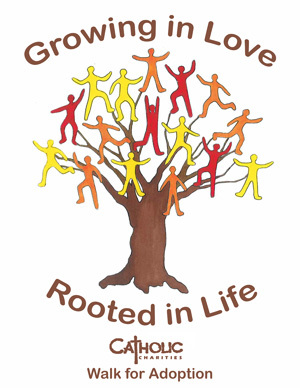 This is my third year to participate in this worthy fund raiser. It was raining so we held it inside the Bishop Kelley gym and field house. I think a good time was had by all. 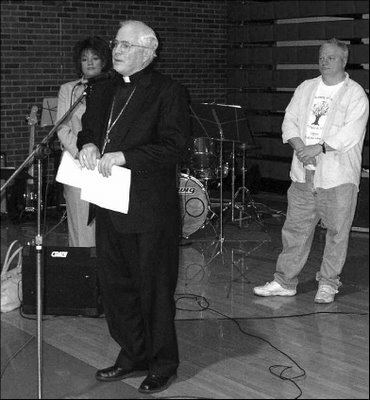 This photo is from a story in the Eastern Oklahoma Catholic where I am pictured with the Bishop and Newswoman Yvonne Harris from KTUL Channel 8 in Tulsa. 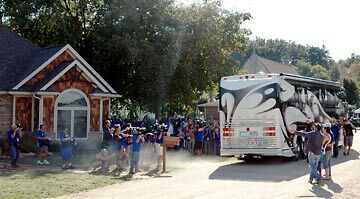 I didn’t see it, but I heard that they showed us on the local Tulsa evening news Sunday night in a story about the walk. Also, here is a copy of this year’s Walk for Adoption logo. I really like it. 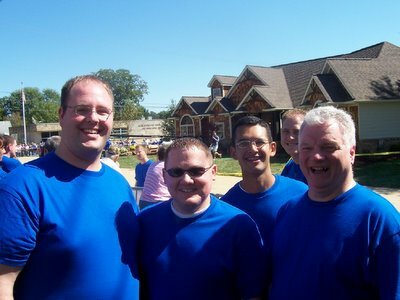 Extreme Makeover – Seminarian Division! This afternoon I, along with about 18 other seminarians and about 10 monks, helped load furniture and various items into the Farina Home. It is a beautiful place and should serve as a wonderful home for this family. I would describe it as rustic and country style. It is 2 stories with about 3,200 sq. feet. In this picture – left to right – are seminarians Eric Schild, Diocese of Toledo, Ohio; Brent Lingle, Diocese of Sioux City, Iowa; Mauricio Carrasco, Diocese of Little Rock, Arkansas; Dominic Petan, Diocese of Lafayette, Indiana; and John O’Neill (me), Diocese of Tulsa, Oklahoma. Behind us is the Farina home. 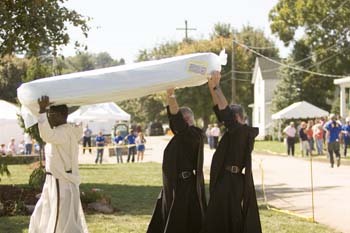 Here is a picture of a few of the monks who helped out. We first loaded a small truck in the staging area. Then we made our way to the house for the unloading of the big furniture items. As the design team ran out of the house to the truck we followed and in about 45 minutes all of the major furniture items were unloaded from 4 large trucks. There was furniture made from logs, nice leather and cloth chairs, desks, tables, pillows, and pillows, and more pillows. As I carried in a large bag of pillows Tanya, from the design team, was punching it like a punching bag. The design team seemed very friendly and upbeat the whole time. Ty was not there at the time. We carried stuff to all parts of the house, over and past cameras, and basically unloaded 4 semi-trailer trucks in less than 45 minutes. Don’t call me for your next move though – unless you can supply about 45 other people. Before we started unloading I visited with Paul (they called him Pauly) and asked how often they built one of these homes. He said they did about 3 every month!!!! They finish here tomorrow (Monday) and on Wednesday they will be in a new location with another family starting all over again. That is pretty amazing. It was good to be just a very small part of a very big project. To learn more about the show click on the link “Extreme Makeover – Home Division” and you will be sent to their web page. Rumor has it this particular episode of the show will air the Sunday before Thanksgiving – just a rumor at this point. I will post the exact date and time as it becomes available to me.